“‘But I wonder if this tale may be too disturbing for you,’ said Uncle Montague, seeing me peering towards the window, turning to the fire and prodding at a log with the poker. After I finished Miss Peregrine’s Home for Peculiar Children, I felt a little bereft and needed another creepy, atmospheric book to bolster myself up. Since I’m in library school now, I try to justify all my reading time as “professional development”, but really, I just like to sit in the park and look at the fall leaves and read fun things that remind me why I want to be here in the first place…and not study for my cataloging test…at least, not just yet. Anyway, look what I found! 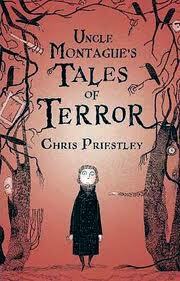 This creeptastic book features Edgar and his rather ominous Uncle Montague. Uncle lives in a candlelit, Gothic monstrosity of a house, replete with red velvet curtains, a lurching butler, and a nightmarish array of artifacts. Edgar regularly makes his way down the forest path to sit in his uncle’s parlor and listen to the stories his uncle tell. It seems each relic in his home has a ghastly backstory, and Edgar’s uncle is eager to share them. There is a unifying theme to these chilling tales, and readers will be kept guessing until the very end of the book. 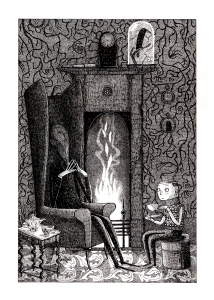 Fantastic, Gorey-style illustrations? Yes. Stories that are both original and spooky? Yes! I especially see this book as hitting that sweet balance of a very engaging subject matter (scary stuff for a slightly older crowd), quirky format, and accessible reading level that is just right for enticing more reluctant readers. Priestley, Chris. Uncle Montague’s Tales of Terror. Bloomsbury: New York, 2007. 237 pp. Ages 10-14. Posted on November 8, 2011 by ShannaPosted in Ghost Story, Horror, Mystery, Short StoriesTagged creepy, ghost stories, Gothic, scary tales.